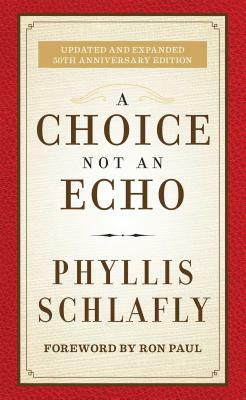 Celebrate 50 years since the release of Phyllis Schlafly's monumental A Choice Not an Echo, the book that launched the conservative resurgence of the late 20th century. This special updated and expanded edition contains 50 percent new material placing the book in its historical context and applying the book's lessons to the issues of today. Phyllis Schlafly is a national leader of the conservative movement and author of the national bestseller, A Choice Not An Echo. She is also a leader of the pro-family movement and led the pro-family movement to victory during the battle over the Equal Rights Amendment. Mrs. Schlafly has incredibly strong media presence, including a syndicated column that appears in 100 newspapers and on many conservative websites; daily radio commentaries that are heard on more than 600 stations, and her weekly radio talk show, "Eagle Forum Live," that is heard on 75 stations. A prolific speaker and strong force in conservative politics, Mrs. Schlafly resides in Ladue, Missouri.